Super clean Scarls! Either you have a lady who does or someone in your vicinty has developed OCD. Do we all get to vote? The toilet seat shape is unlike ones here in Minnesota. It's a lot of excitement for a Friday morning, seeing this subtle difference. Yours is rectangular, while ours is more oblong. As for another rating system, if you could get a shot of the toilet paper as well, that would be lovely. Macy: Yeah.. I think I have an OCD, either that or I am a lady who does! Yes, that's a good idea, I think you all should get to vote. Pearl: I have noted your toilet paper suggestion... toilets will be down-rated if they have any of that shiny stuff and if it's impossible to get the paper out of the dispenser. I would be interested to see a picture of your loo so that we can compare notes. Does Miss Scarlet have a rectangular bottom? Sorry. Suggested additional grading category: toilet paper quality! For example, I would have rated the paper at the Enlisted Men's Club on the British Naval Base at Singapore as low quality, except that it had a watermark with the Royal Navy insignia and words to the effect that it was property of the Queen! 10/10! You've spent all week cleaning it, haven't you? My broken cistern was replaced (by a smaller one - so now I've got to redecorate) this morning. You're welcome to visit, but wait until the paint's dry. Have you mistaken me for some kind of pervert? Mr LAX: And do you have any of the Royal toilet paper to hand? I have a peach shaped bottom, or so I've been told. Dave: Er... yes...! I have been cleaning this morning... well you know what Mr Jimmy's like, he still makes derogatory comments about my kitchen floor. Perhaps I will do as MJ does and ask commenters to subbmit pictures of their toileting facilities to feature on the Friday Flush? Mr Scurrilous: Are you not interested in Ladies toileting facilities??? I regret to this day that I did not keep a sample of the Royal Paper. How very uplifting all of this is. Here we of course refer to the lavatory seat and lid which, in our book, [or lavatory], should always be returned to the closed position after use. 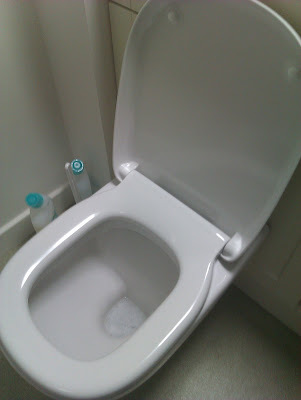 Thus, in this instance, even accepting your wish to demonstrate the very high standard of cleanliness employed in the Scarlet household, we should challenge the award of 9/10 believing that a further half a mark should be deducted for not showing the water closet closed. However, for originality, and here we are flushed with excitement, we should upgrade your score by a further one and a half marks to give you a highly deserved total of 10/10. The Top Hats: I must apologise for exposing my bowl, the cover, you will be relieved to know, is usually in the down position... but in the interests of this post an upright position was necessary. Thank you for the grading! I am now at the top of my flushometer. Savvy: YES!!! Now this is the comment I have been waiting for! By the end of this series I hope to have the definitive answer to this eternal question. Sometimes it's difficult to tell whether the paper has been fitted over or under when in a dispenser... but I have a hunch that it is the paper direction that can hamper its flow. I intend to thoroughly investigate my theory. I always leave a territory marker - it's a male thing, but Mrs Chairman ain't too impressed with my masculine behaviour patterns and calls them Neanderthal. 9/10 Do you origami the paper Scarlet? An Extra point if you do. Some say it's gauche, but I like it and if it's good enough for the Valparaiso Palace Hotel in Palma then it's good enough for me. 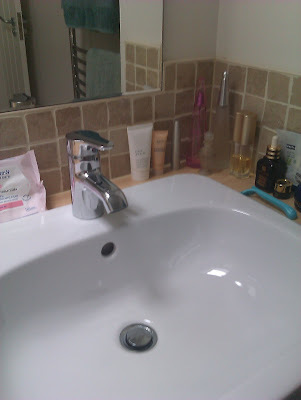 I think you have the shiniest loo, and sink, I've ever seen. And I see you use ecologically friendly cleaning products, which definitely gets you an extra two points. I always like it when I enter a public lav to find it has flowers and gilt framed mirrors, even if it's otherwise a bit skanky. Nice soap makes a big difference too, and matching hand lotion gets top marks every time. Perhaps we should have a whip round and get you some towels you like. Good luck with your under/over research. There's something bordering on moral rectitude about under as far as I'm concerned, but I'm willing to be swayed. Wobbly seats are my bete noir. I will be calling regularly now for a "Flush on Friday" I am an avid fan of all things lavatorial (particularly humour)and will be keen to read your own thorough appraisals of "Miss Scarlet's most liveable loo's". I always find the presence or absence of interesting graffiti a note to score on. Seat? I rip them off during installation. Mitzi: I have been known to stack my rolls in a pyramid formation... if it's good enough for Ferrero Rocher, then it's good enough for me. Eryl: You spotted the Ecover! I'm a bit funny about bleach and I'm always very careful about what I throw down my sink. When I was in my twenties I was so freaked out about chemicals that I tried making my own cleaning products from lemons and vinegar! The did work, but didn't store well. I wonder what my roll stacking says about my morals?! Pat: Same here! And they are usually cracked as well and alive with bacteria. Just saying! Princess: Graffiti! I will certainly look out for it... and any other reading material for that matter. Such as phone numbers for interesting and lively people. The caulking around the toilet bowl tiles on closer inspection appear to have a degree of xerophillic spores on the surface. These attract moisture in the air and accumulate around 6 million types of germs everytime the toilet is flushed. In Scarlets case this will equate to 24 million new germs every hour. Tile grout and toothbrushes are notorious havens for bacteria and are often transferred to humans via touch. Shaken hands or kissed anyone lately doll? Don't even get me started on the floor. As for the silver bullet shaped object to the right of the 'tap' not 'faucet' you are English hen,I can only guess as to its use in the bath. Don't forget to rate the quality of the graffiti and the quality of any reading material supplied. It's amazing the number of swish-looking restaurants I've been to that have remarkably scummy toilets. I'm loathe to go back however brilliant the food. I think Chairman Bill is the last man. Wherever he leads me I'll follow! Vinegar is good for all cleaning - just not on the carrara tiles. Seriously: No mixing of cleaning agents! It's a bad idea to throw in some additional Domestos (does that stuff stille xist?) - chances are that a reaction leads to Chlorgas - and that's what was used in WWI as poison gas. Mr Jimmy: I knew you were going to be trouble! Please do not worry about my germs; I always wear gloves whenever I kiss anyone and the bullet shaped object IS A PERFUME BOTTLE. Mr Mags: I once passed out due to the overuse of Milton. Smells like swimming pools, but I think it nearly killed me. I think this will make a big contribution to all Gentlewomen's way of life, my dear. We all like a clean loo, and to know that men have not sprayed around like a feral tom-cat, but I would like to raise the topic of the access to the loo in restaurants. On a recent trip to London, my friend Jennifer and I dined at a moderate establishment near Hatton Garden, and when I went to excuse myself, I was directed down some horrid stairs, past a gilded reproduction of Michelangelo's 'David'. And do you know what the owner thought was the height of sophistication? Its 'man zucchini' had been replaced with an 8-inch strip-light tube! I was shocked! To be lit to one's toilet by such a thing - and Jennifer nearly had a stroke when she saw it. Ms Jessop: Hello and Welcome! Oh dear, what a dreadful experience for your friend. I have made a note of the delicate issue you raise, but I fear that in a similar situation I would become quite feeble and also have a stroke. I'll avoid it then, thank you. very very impressive - I won't be revealing my lav for scoring. Your post has inspired me to show mine to the blogging world too. I'm flushed with excitement now! This is such a valuable social resource! I've recently stopped at the M4 Membury service station and a Scarlet review of the flush facilities would have helped me choose between stopping there or holding out for somewhere nearer the west coast. Ahhh...Can I play? Do I have to wait for Friday, before I can put pictures up of my downstairs loo? Mr Mags: No, not that sort of Milton... I would have been fine with that, I meant this Milton! Lulu: My towels are old, stiff as boards, and the wrong colour for my bathroom. I need some natural fluffy ones and then I'll give myself 10/10. Mr Joey: I am expecting your bowl to be solid gold! Wendy: I can see this all growing into a huge collaborative project! Miss Roses: And would you like me to review your downstairs loo? I must warn you that I have Mr Jimmy on hand to offer advice... he takes no prisoners, as you can see from what he said about my bathroom! I will be showing you mine at some stage this week. Scarlet: just a word about fluffy towels. Many people - as they get older get lumps and bumps on their skin - not necessarily cancerous but a nuisance. Your rough, hard towels ensure that your skin gets a brisk, exhilarating rub down which gets rid of all the dead scales we are shedding all the time and leaves your pores unblocked and able to breathe. There it is. At first I thought of security against bathroom criminals trying to steal supplies, but as a user of the facilities that's not an issue. That's more a job for the maintainer of the facilities. My favorite security method (which I see you have adopted) is to keep the facility so pristine that nobody would dare mess with it. Sorry, I'm not in baby sterilizing. Dave: I have now seen yours. Thank you. Pat: Oh but for the occasional soft fluffy towel though!! But what you say is correct. Indeed! I have a bucket outside for guests to use. Mr Mags: Heavens, why not???? Nick: Mr Jimmy does floors, I wouldn't want to encroach on his territory. Wendy: I will be using many of your readers' suggestions. They have been most helpful, including Brian. Leah: Hello m'dear, hold on for tomorrow's post... I have pictures... and they're not very pleasant! This is all much too exciting for me! You see, I rate the facilities in my city so that I know where to go when I'm out and about and nature calls. I am also thrilled to see a bottle of L'Eau d'Issey on your counter. Will there only be toilet-related posts in the future? We will be shown LX, Fryday is already looming. Apologies! I've been rung ragged this week and it's not a pretty look.. there should have been a post between flushes... but I lost track of time... I will try not to let this flushing fixation turn me into a bog blog. Oh, this isn't a new post. It is Friday, isn't it? So THIS is where you've been hiding the past few weeks? !